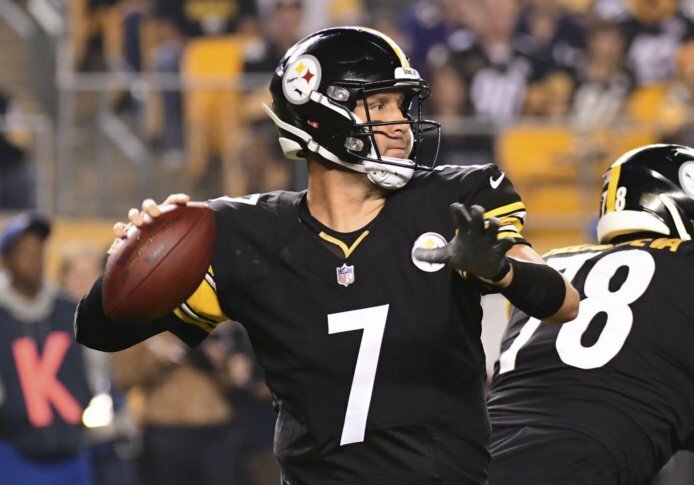 PITTSBURGH (AP) — The Pittsburgh Steelers can’t blame their latest loss on a struggling defense. The Steeler defense allowed Kansas City’s Patrick Mahomes to throw for six touchdowns in Week 2, while Tampa Bay’s Ryan Fitzpatrick threw for more than 400 yards last Monday. The Steelers (1-2-1) struggled defensively at the outset against Baltimore (3-1) as the Ravens held a 14-0 lead less than seven minutes into the game. They settled down and allowed four Tucker field goals the rest of the way, but it wasn’t enough. Quarterback Joe Flacco completed 28 of 42 passes for 363 yards, with TD passes to John Brown and Alex Collins as the Ravens ended a three-game losing streak to their AFC North rivals. Tucker accounted for all the scoring after halftime as Baltimore ended Pittsburgh’s long run of success on Sunday nights. Pittsburgh came in having won nine straight Sunday night appearances, a streak that included a pair of victories against the Ravens. Baltimore brought Pittsburgh’s run to an abrupt end by shutting down Roethlisberger and the Steelers in the second half. The Ravens have allowed just nine points after halftime in four games. Flacco and the Ravens started strong on Sunday. Flacco completed his first six passes for 73 yards and two touchdowns, as he led the Ravens on an 8-play, 75-yard scoring drive and quickly capitalized on a Steelers’ turnover. Brown caught the Ravens’ first touchdown with Joe Haden and Cam Sutton giving chase on the 33-yard deep pass. Ravens’ S Tony Jefferson ripped the ball from tight end Vance McDonald’s grasp, and Flacco tossed a 3-yard swing pass to Collins three plays later. Brown beat Terrell Edmunds on a 71-yard deep ball, but the Steelers’ rookie first-round pick recovered a Collins fumble on first-and-goal from the 2-yard line three plays later. It was the first time the Ravens didn’t score a touchdown in the red zone this season, going a league record 13-of-13 in four games. It also briefly swung momentum in Pittsburgh’s favor as Roethlisberger led the Steelers back from the early deficit. Tucker kicked a 47-yard field goal on the Ravens’ second possession of the second half, and then ended two clock-churning drives, spanning more than 11 plays and six minutes with field goals of 49 and 28 yards, increasing it to a 23-14 lead with less than four minutes to play. Tucker’s final field goal, a 31-yarder, came four plays after a Roethlisberger interception.